I had the great pleasure of meeting Mr. Benjamin Robert, a 7 lb 4 oz baby bear cub. His mommy and daddy waited a long time for his arrival and you can’t imagine how in love they all are with each other. Newborn baby boy was just the sweetest baby model. Mom told me that when they found out they were having a boy, her very sweet husband bought her a necklace with a bear on it and the letter B. Benjamin’s nursery is bear themed, so I knew I had to use my fuzzy bear ear bonnet. My grey Flokati from Luneberry matched perfectly and I loved how his little red hair came out in wisps. The wrap is from The Original Photoblocks Prop Shoppe. 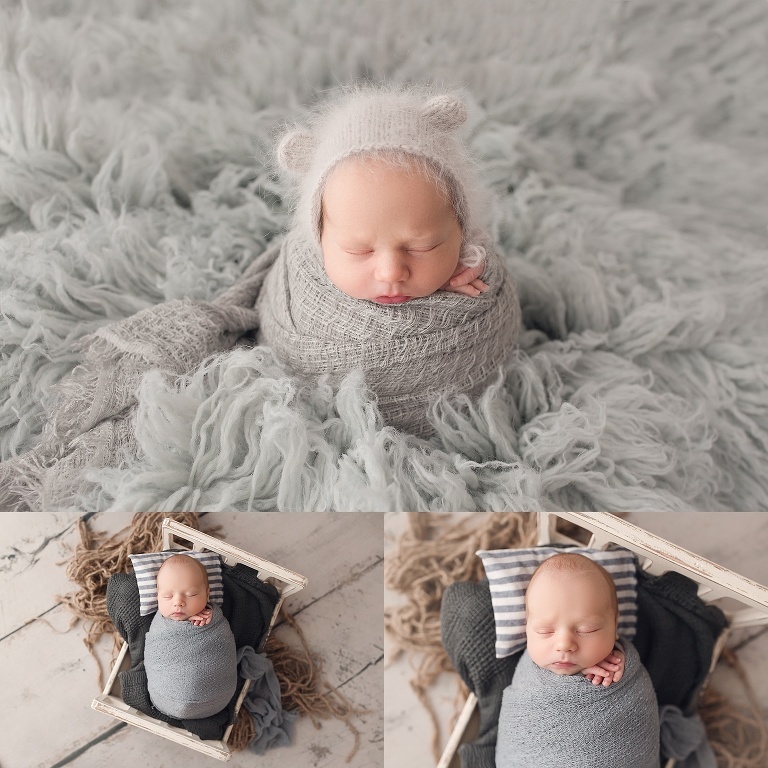 Mr. B. was such a sweet newborn boy that I decided to try out some new props, and I absolutely love the striped brown pants I have from Indigo and Lace. He curled right up on his tummy and I love the baby rolls on his back. He had the cutest smirk on his face too. Baby boy gripped the blanket back drop from Freebird Prop Shoppe so sweetly. I really could have taken his picture all day long. Mom and Dad told me that Benjamin has a fur sibling- their puppy Dante. He was a bit unsure of this new addition to his pack at first, but now he’s in love with him. Mom and Dad like football and hockey, and they even brought in a few sports props to use for the session. I always love to use something that has meaning to the family. I very much enjoyed meeting this wonderful family!